Cutting conditions – feed depth, and speed of cut. Cutting edge: Edge that contact with the workpiece during the cutting process. The face of the tool: The surface over which chips flaw while cutting. Flank: Surface below the cutting edge. Shank: Lower parts of the tool. Nose and nose radius: The nose is the junction where major and minor cutting edge meet. Smaller nose radii produce a smooth surface finish. Lip angle: Angle between the top face and the end flank. Back rake angle: The downward slope of the top surface of the tool from the nose of tool to the rear along the tool axis. It controls the direction of chip flow. 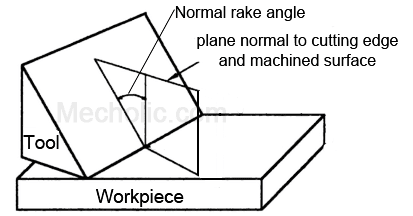 Back rake angle may be positive, negative or neutral. 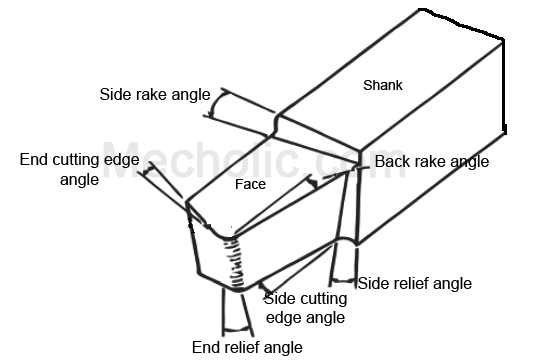 Side rake angle: The angle with which the top surface inclined sideways. It provides a clearance between tool and workpiece and prevents rubbing. Large side rake angle results in good surface finish. Side relief angle: The angle between flank below the cutting edge and a line perpendicular the base of the tool. It is also known as side relief angle. End relief angle: The angle between the end flank and plane normal to the base. Extra edge clearance is provided; it is also called clearance angle. Large end relief angle causes the breaking of cutting tool. End cutting edge angle: The angle between end flank and a plane perpendicular to the side of the shank. Side cutting edge angle: Angle between side cutting edge and the line extending from the shank (or a line parallel to the tool axis). 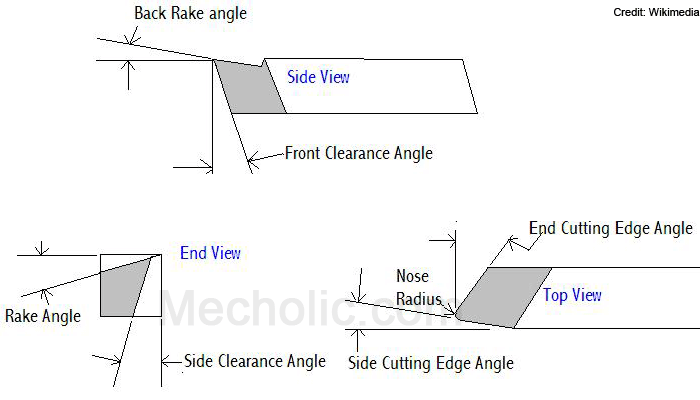 Normal rake angle: The angle measured from the normal to the machined surface, in a plane normal to the cutting edge. Angle of inclination: Angle of tool axis with cross slide motion. - What is Tool Signature of single point cutting tool?